From left are Toby TenEyck, food and beverage director; Michael Conners SRMT chief; Todd Papineau AMCR general manager; Emily Lauzon AMCR assistant general manager; Benjamin Herne SRMT sub-chief; and brew master Justin Cree. Photo submitted by AMCR. 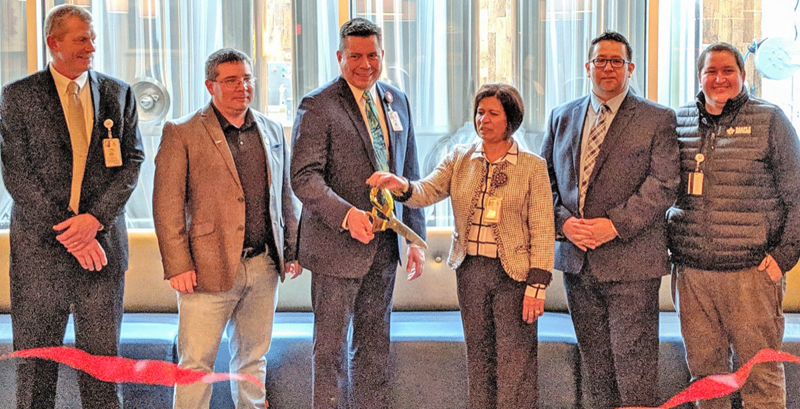 HOGANSBURG -- The Akwesasne Mohawk Casino Resort celebrated the grand opening of Maple Brewing on March 1. The grand opening kicked off with a ribbon cutting ceremony, live music, beer tastings and tours. The casino is looking into distributing and offering the beer off property. “Maple Brewing features flavor profiles such as Belgian witbier, winter ale, double India pale ale, lager, pilsner, and porters. We will offer limited editions, and create seasonal brews to give to our guests a unique tasting experience in the North Country,” Brew Master Justin Cree said in a prepared statement from the casino.